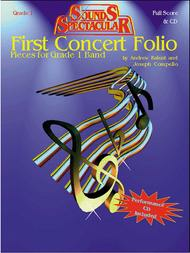 First Concert Folio (Pieces for Grade 1 Bands - Full Score with Piano Reduction and CD). Composed by Anonymous Joseph Compello. Edited by Joseph Compello and Andrew Balent. Arranged by Andrew Balent Joseph Compello. For Flute, Oboe, Clarinet, Alto Saxophone, Bass Clarinet, Euphonium, Tenor Saxophone, Trumpet, Horn, Tenor, Bassoon, Tuba, Percussion. Concert Band Method. Sounds Spectacular. Score and audio CD. Standard notation. 76 pages. Published by Carl Fischer (CF.O5415).ISBN 0825833108. With Standard notation.